Pinterest, Instagram and Twitter that is. I suppose if I want this blog to have followers, I am missing the boat, but seriously, I don't get them. Maybe the problem is that I limit my social media. The closest I ever game to MySpace was writing this blog when it was only about my son and the fun things we were doing. I was on a marriage message board back in 2000 and a birth message board in 2007. But I came very late to the party on Facebook maybe when we moved North in 2010. I mostly did it again, to stay in touch with family. But having an Instagram, Twitter or Pinterest account confuses me. Let's start with the ones that I truly know nothing about... Twitter. I thought it was something that you only did from your phone. You can only type x number of characters and you "follow" people, like stars and stuff who tell what they are up to that second. Huh? Why would I care? If I really want to know what anyone I care about is up to, I can just get on Facebook CALL THEM! Maybe I have that all wrong, and it has some value in my life. But since I have been living without, I am going to go with, NOPE. Then there is a new one called Instagram... it is all about posting pictures and again, "following" people through their pictures. Am I missing the boat here? I thought I could do that on the social outlets I already use - my blog for one, Facebook, or Shutterfly. I don't see a need to have ANOTHER location to upload photos. Seriously, is there more to it than I can understand. I have to be honest, I have never even explored the option, so maybe there is. If anyone wants to, please enlighten me. Now here is my all time favorite, I don't get it - Pinterest. I signed up at the bidding of everyone. "You will love it", they said. "You have to do it", they said. I couldn't tell you who "they" are. Trust me, though, they were saying it. So I did, and I tried to set it up. Then I was stuck. Basically, as I see it, it is a like a giant Favorites list, but on a website instead of right here on my browser window. Why is this more beneficial to me? The only logical answer I have for this is that if your computer were to crash and be unrecoverable, you lose your favorites. On Pinterest, you're safe because the data is stored on their site. I am a Google girl. We are buddies. I search, he provides (I assume it to be a he, though not so logical when thinking about a man's "search" habits LOL). When I find a link that would be useful at a later date, I either add it to my Favorites Bar with a simple click or I use - gasp - 2 clicks to add it to my Favorites List. I creat folders there - Running, Blog, Recipes, Shopping, Bills, etc. When I want to revisit them, I open a folder, click a site and boom, I am there. Sounds eerily like... Pinterest? Please, please someone tell me that I am not the only one! I have to say that I think this breakdown in understanding has to do with the fact that some of us have lived lives that actually continued to exist without this technology. The generation who are just younger than us have never had a "tech free" existence, so they see everything as crucial. I have a FB, Blog and Instagram. I love Instagram. I can check it in seconds and keep up with people I care about quickly, where FB takes for.ev.er! I view Pinterest as a favorites list for visual learners. I can't handle/manage a favorites list...there are no pictures for me to look at and my brain works almost entirely from pictorial memory. Funny, I am visual too. But I am also have a photographic type memory. I could remember where the words were on a page for a test. So I guess that is why folders work for me. Pinterest is a fun place for me. I get recipes, craft ideas, organization tips and decorating ideas. I love it! I have Instagram and Facebook also. If you don't find them necessary, then don't do it but to me they are fun ways to keep connected. And honestly when I am at the gym riding a bike or waiting in a doctors office, I use these things to kill time. Like all things, they aren't for everyone. I don't like Twitter but I love Instagram and Pinterest. I am a lover of photography so anywhere I can see and share photos is good to me!! 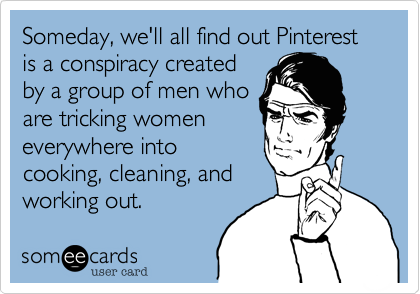 Pinterest is great because I see what other people are pinning that I might not see anywhere else. I have gotten some great ideas from there. Recipes, craft, storage etc. I use Instagram as a motivational thing. I follow other healthy eating exercise people and it's really motivating!